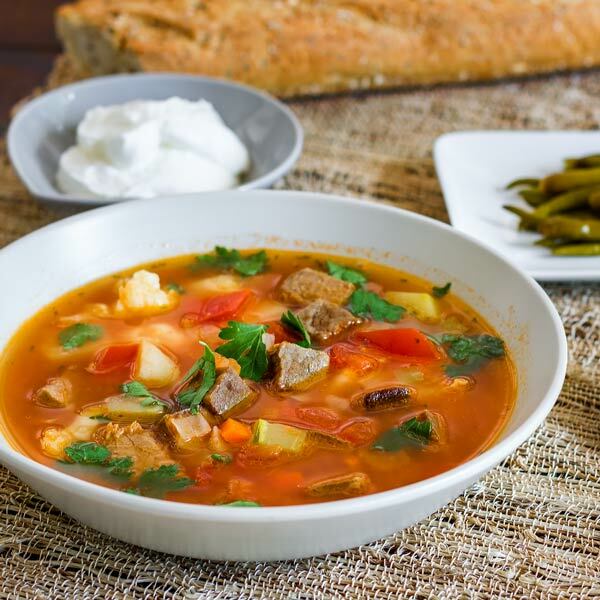 The thing about Romanian soups is that most of them are sour, which is definitely not a bad thing as far as I’m concerned, but if you were not born somewhere in Eastern Europe, you might have a hard time getting used to them. Actually chicken soup is not sour in Romania either but is pretty much the same everywhere anyway, hence “taste like chicken” thing. Now, this is definitely my fave soup recipe and if you can go past the fact that you have to boil the beef to death then you are in for a real treat… don’t forget the sour cream and the spicy peppers. It is not that difficult if you have patience when boiling the beef, other than that it is pretty easy. Some things are “optional”, like rice which I hate in my beef soup, or cauliflower and zucchini, or the beaten egg added to the end. Well, mine has cauliflower and zucchini but the rest is up to you, use your own combinations but do not forget the lovage, it is a must. If you cannot find it anywhere, is time to grow your own. I will be definitely worth it. Start boiling the beef for 2 to 3 hours, until tender. In a sauce pan heat the olive oil and add the carrots, onion and celery and sautee until tender. Do not burn. After the meat has been properly boiled, add the onion, cauliflower, and carrot mixture to the beef and broth. Add the tomato paste, juice from one lemon, salt and pepper to taste, add the rice and let simmer for another 30 minutes. 5 minutes before it's done, add zucchini. After 30 minutes, add the egg to the soup, it should end up looking like pasta in your soup. Take off heat and add chopped parsley. Serve hot with sour cream. It's delicious on a cold winter night.